The flagship cryptocurrency, Bitcoin (BTC ) has recently seen its price drop after it rallied from a sell-off that saw its price plummet below the $4,000 level for the first time since September of 2017. Remarkably, the digital coin has been holding on to this level. According to data from TradingView, the BTC is trading around the $4,022 level at 15:00 GMT, after losing about 8.9% of its value in the past 24-hour period. At the moment, its market capitalization is at $69.6 billion. Exactly one year ago, Bitcoin broke the $10,000 barrier and many investors were expecting a similar bull run at the end of 2018. However, no new fundamental announcements or changes in the crypto industry seem to have positively impacted on the price of Bitcoin yet. Every indicator leads to the conclusion that the crypto winter may be longer than investors hoped for. The former vice-president of Multi-Asset Sales at Goldman Sachs and a partner at BlockTower Capital, Michael Bucella has said that Bitcoin is at the end of a distressing cycle. He made this statement during an interview with CNBC’s Fast Money. Strong hands are actually quite patient, and so I think a lot of the volatility and the gap risk we see in the market right now is a function of the participants that are still there. And I think we’re actually in a significant distress cycle in crypto, and the last leg of that is typically the most volatile and most short-lived. Michael Bucella has also said that the current bearish market is offering very good price entry points for those who are accumulating the virtual coin. He went on to acknowledge that world’s smartest money including those from Harvard, MIT, Stanford, and Yale are now being poured into crypto space. 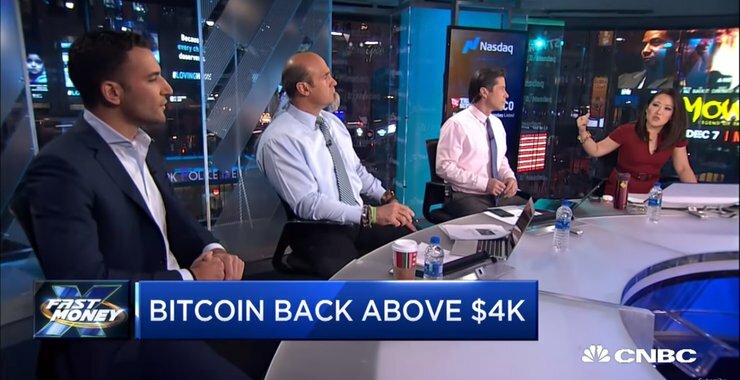 Meanwhile, the managing partner at Fundstrat, Tom Lee maintained for a long time his earlier prediction of $25,000 by the end of the year Bitcoin price before dropping his target to $15,000 earlier this month. According to Lee, it takes Bitcoin about 9 days to make a full year’s gain, so holding on to funds can make sense rather than making an attempt to time the market. The BTCUSD pair was in a bullish trend on Thursday. The price in the lower time frame is above the 12-day Exponential Moving Averages (EMA) and the 26-day EMA which shows that price is rising. The trend line is broken and the following candlesticks closed on the opposite of the trend line. The Stochastic bands are indicating a buy signal as they are above the 20% range. When the blue band of the Stochastic is above the red band; it shows that the ongoing trend has been reversed. In the meantime, Bitcoin price has been fluctuating above the $4,000 price mark since November 28. Moreover, on the 1-hour chart, the price of Bitcoin is in a sideways trend. The price climbed to a high of $4,447 while in a bullish trend on November 28. However, the bullish trend was interrupted the following day, November 29, and it dropped to the low of $4,210 to commence a range bound movement. Furthermore, the price action is now constituted with small body candlesticks like Doji and Spinning tops candlesticks. This shows that buyers and sellers are indecisive. The virtual currency now fluctuates slightly above the $4,000 price level and it is expected to test the $4,500 price level. On the other hand, it may continue its range bound movement.